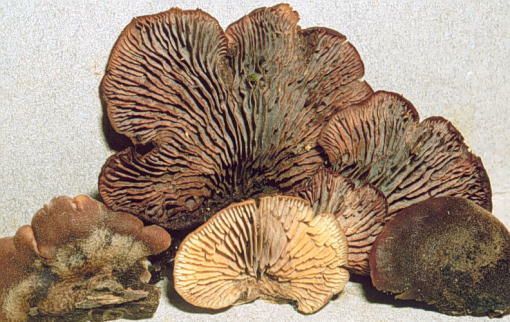 Species of Lentinellus are usually pleurotoid and generally lignicolous. The lamellae are serrate to finely serrate. 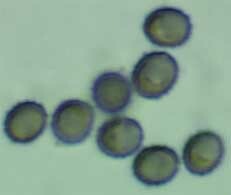 Microscopically, the spores are echinulate and amyloid (see below). The species illustrated typically becomes dark brown with age (most of the basidiomata seen here) and is quite velvety tomentose to pubescent. The taste is styptic! The fungus is to be expected wherever there are downed oak logs. We have seen it at sites in the Talamancas. Dr. R. H. Petersen (pers. com.) has suggested that L. ursinus probably does not occur in the montane Neotropics.